Welcome to the Gardendale Orioles Tee Ball Home Page. Practice began Saturday February 28 at Field #1 at 9:00am. 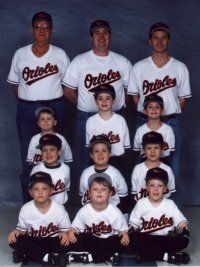 On April 20, 1998 the Orioles won their first game 21-11. During the season the Orioles won only four games but the boys improved at a steady pace. Every single one of them got better, faster, hit harder, and became better young men. We went from freezing cold weather to scorching hot weather and they all kept coming and trying. We had no quitters. That says a lot for their parents. On Saturday May 30 the Orioles played their final game in the tournament. We lost by one run to the team that came in second place in the league. The Orioles never quit, right up to the last out. There have been visitors since March 1, 1998.